Frank Adler: [through the door] Hey! Hey, come on. Let's move! Frank Adler: Let me see. Frank Adler: Come on, I made you special breakfast. Mary Adler: You can't cook. Frank Adler: Hey, Mary, open up. Frank Adler: You look beautiful. I knew nothing about this film. Had seen no adds, heard no word of mouth, pretty much nothing. I only found it only after tapping out the local AMC 24 and driving a few extra miles to see something new. The premise was intriguing: What to do with a seven year old mathematical prodigy caught between a cozy, loving household occupied by her doting Uncle Frank and a one-eyed cat named Fred, and a challenging but cold academic world ready to pace her on mental treadmills for the rest of her life. McKenna Grace plays little Mary who's character is at the center of attention whether she likes it or not. Mostly not. Grace's performance does raise a few eye brows as she very convincingly plays a precocious and genius little girl plagued with boredom being surrounded by the dead-weight of average students she has nothing in common with. In fact, Mary's personality is also far developed beyond her peers, exhibiting a sarcastic and jaded sense of humor more on par with a bunch of 40-year olds downing a shot or two after a particularly bad day at work. After Mary's abilities are discovered by her first grade teacher, the inevitable battle for command of her future quickly unfolds. One very powerful supporting role is supplied by Lindsay Duncan who portrays Evelyn the Grandmother. Evelyn is a poised and proper Englishwoman armed with a titanium intellect few would want to challenge. As the legal proceedings unfold, Evelyn verbally fire-bombs the entire court room from the stand without batting an eye in her fight for custody of Mary. Her arguments and assessments are hopelessly air-tight and seamless, leaving Uncle Frank and his lawyer scrambling. Frank just wants Mary to be a little girl. Grandma wants to plug her into The Matrix. Who will win? 'Gifted' is not without it's displays of some original laughs. My favorite was a scene in which little Mary discovers her Uncle Frank is sleeping with her 1st grade teacher, who one morning comes stumbling into the kitchen wearing only a towel. Their reaction to each other is priceless. As to why this production is flying under the radar with virtually no advertising or promotion is baffling. The hour-and-a-half flew by for me and left me with an odd feeling it ended too soon. Aside from that, there was almost nothing wrong with this film, at least not that I could find. 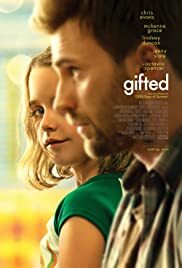 Warm, unique and entertaining, 'Gifted' should stay with you for days afterwards. A great family night movie. 106 of 135 people found this review helpful. Was this review helpful to you?